This year, I'm delighted to have been asked to be a Yarn Shop Day Ambassador along with Lucy from Attic 24, and designer Erika Knight. It's a tough gig owning any kind of shop in our current economic climate and owning a yarn shops is often a labour of love rather than an aspiration to any kind of little goldmine (despite the amount you might spend in yours), so anything that we can do to show our extra appreciation for our yarn shops is, in my mind, the least we can do. Yarn Shop Day is an opportunity for us to make that trip to a new yarn shop that you might have heard of (and there are new ones opening all the time which shows the tenacity of crafting people), to drop into your local one even though you might only have been in last week, or to go a little further afield because, after all, a day out with a yarn shop visit included is a day well spent. What's in it for you? Well, there will be all kinds of events being held at the yarn shops; some might have visitors (like me! ), others will hold workshops, there may be special discounts or competitions, but most of all, it's a good excuse to support your local business and that feel-good factor is as fabulous as anything that comes in a goody bag. I'm going to be at my local yarn shop - Black Sheep Wools - from 9.30am - 12.30pm on the day if you're in the Warrington area, but do check out the Yarn Shop Day website to see what else is going on. Let's Knit have just launched their new Yarn Shop Day website which will be updated as the date gets nearer with information on which shops will be taking part so you can see if your LYS is involved. 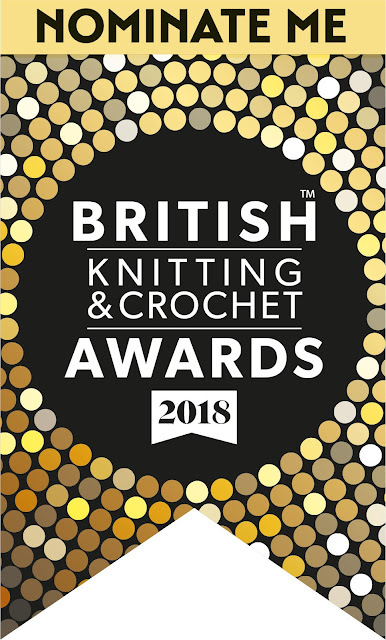 The second exciting thing - again involving Let's Knit magazine - is that the nominations for the British Knitting & Crochet Awards 2018 have opened. These are the biggest craft industry awards and all of the nominations and winners are chosen by the crafting community - that's you! I've been thrilled to have been nominated for these awards for the last two years and to have won an award both times too - third place in the Favourite Knitting Book 2016 category for Super Socks and third place in the Favourite Knitting Blog 2017 category. The competition for these awards is super-tough so I can't tell you how much I appreciate your votes! If you'd like to nominate Winwick Mum again this year, I would be delighted ... thank you! You can click on the photo below or this link to go to the website, and there are prizes up for grabs for everyone who makes a nomination - a giant hamper of yarn, accessories and gadgets worth £300 or one of two £50 book bundles. Nominations close on 12 April and the voting for those nominated in each of the categories will open on 7 June, closing on 30 August. UK residents only, unfortunately! Yarn Shop day is on my birthday. Now there's a thought. "Little havens of wooliness are available for us to squish all kinds of yarny goodness" may be the best description I've ever heard of yarn shops. It is perfection and makes me want to find a haven and do some squishing right this minute!!! So from Connecticut, USA, thanks for your way with words. Good luck, hope its a bumper turn out on the day at Black Sheep Wools.